Is this where the sponsorship model meets the daily deals craze? Today, popular common interest website, Meetup.com, launched MeetUp Perks which allows local businesses to target the nearly 80,000 groups in its community with discounts, deals and other membership benefits. Businesses and organizations offer really compelling Perks (e.g. 25% off yoga class, free meeting space & appetizers, 20% off bikes, etc) to relevant Meetup Groups based on topic and optionally location. These aren’t one-off deals. They are ongoing Perks that support local communities and earn loyal customers. 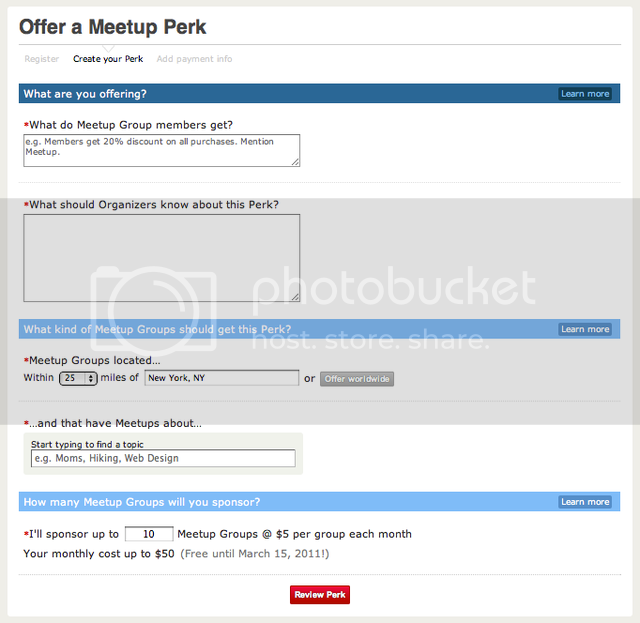 Organizers of active Meetup Groups that match the topic and location criteria will be notified up to once a day of new Perks available for their Meetup Groups. The first Organizers who opt into an offer get to extend that Perk to their members -- so if you want it, be sure to act quickly! The DIY group sponsorship model is similar in some ways to start-up, groupable.com, but has the advantage of already having reached a critical mass of groups, which sponsors may find appealing. 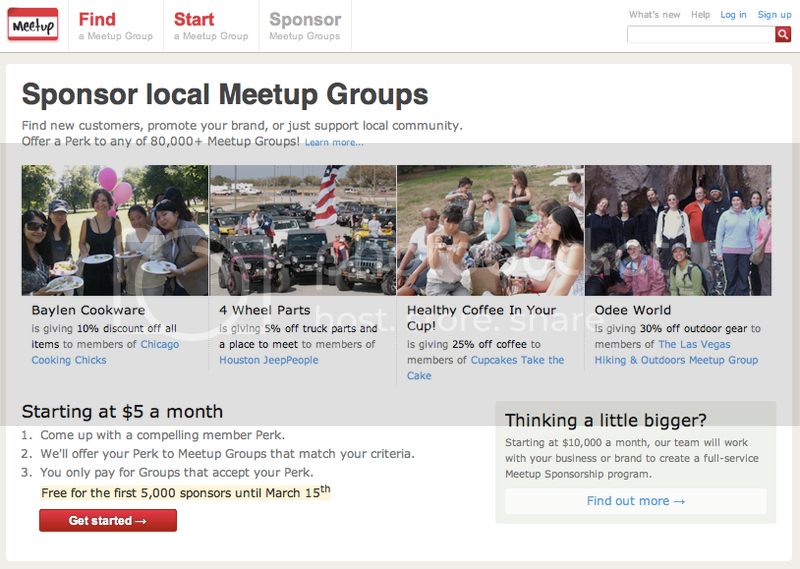 Another point of difference is that Meetup Perks seems squarely focused on very small, hyper-local deals. Meetup will charge a flat fee of $5 per month to businesses for every group they sponsored. The idea is to create long-term relationships between groups and local businesses. So if you want to make sure MeetUp groups are meeting up at your coffee shop, restaurant, bar, etc, sponsoring local groups it seems, may be a good place to start.